It is a 13th-century (1200s) illuminated manuscript, as is the Aberdeen Manuscript. First, I must apologize. 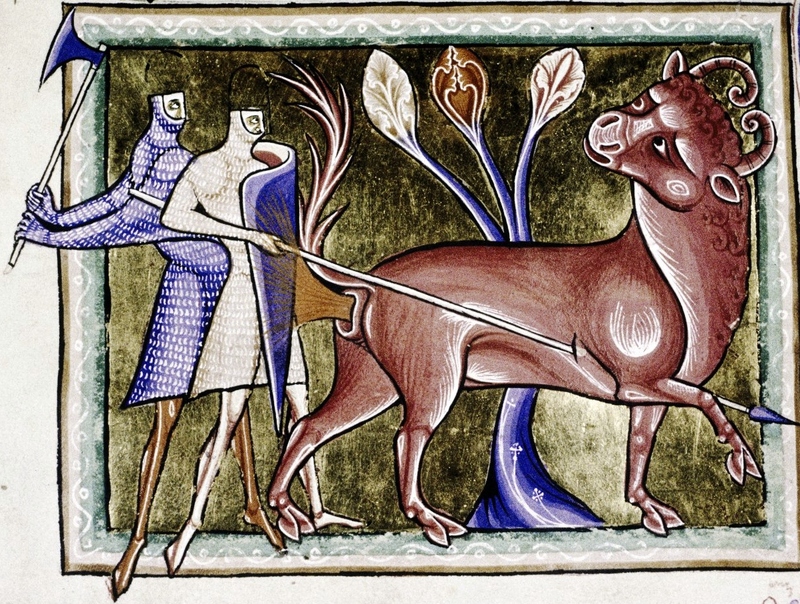 My post on the Aberdeen Bestiary had lost several paragraphs when I published it. I did not notice that my text was incomplete until later in the day. I have now rewritten the missing paragraphs and have posted my article again. 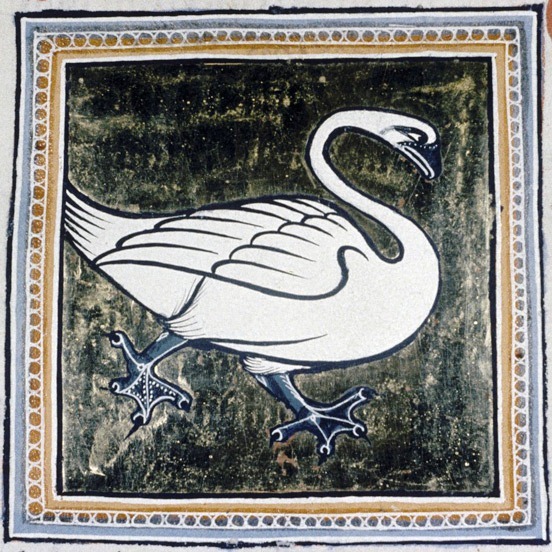 The current post deals with the Ashmole or Ashmolean Bestiary (the two names are used) and it is believed that it was illuminated by the same artist as the The Aberdeen Manuscript which originated in England and was probably illuminated in Lincolnshire or Yorkshire. But, the current post also contains information regarding the history of books. I have written about the paper, or parchment, used by artists illuminating books: sheepskin, goatskin and calfskin. The Aberdeen Bestiary was written and illuminated on sheepskin or goatskin. However, the Ashmole Bestiary was written and illuminated on calfskin, or vellum, which is the superior paper. 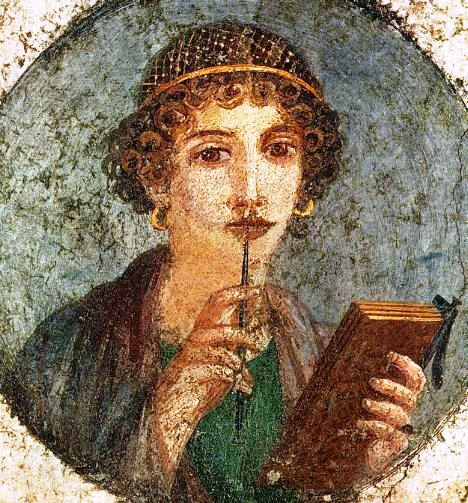 Woman holding wax tablets in the form of the codex. Wall painting from Pompeii, before 79 D.
Both the Aberdeen and the Ashmole manuscripts are codices, the plural form for codex. Codices are books as we know them, i.e. we go from page to page sequentially. However, the binding used in the Middle Ages was of better quality. The pages were connected to one another using a thread. Some illuminated manuscripts were left unbound so one could see the illuminations in full. But, the pages were eventually bound together, which had one important advantage: pages could not be stolen. The Aberdeen Bestiary has incisions, i.e. someone cut out part of certain folios (feuilles, leaf). That’s unfortunate, but we at least know that part of the page is missing. How can we tell when the entire page has been taken away? Codices contained sequential folios (leaf, page), which was not the case when books were written as scrolls. 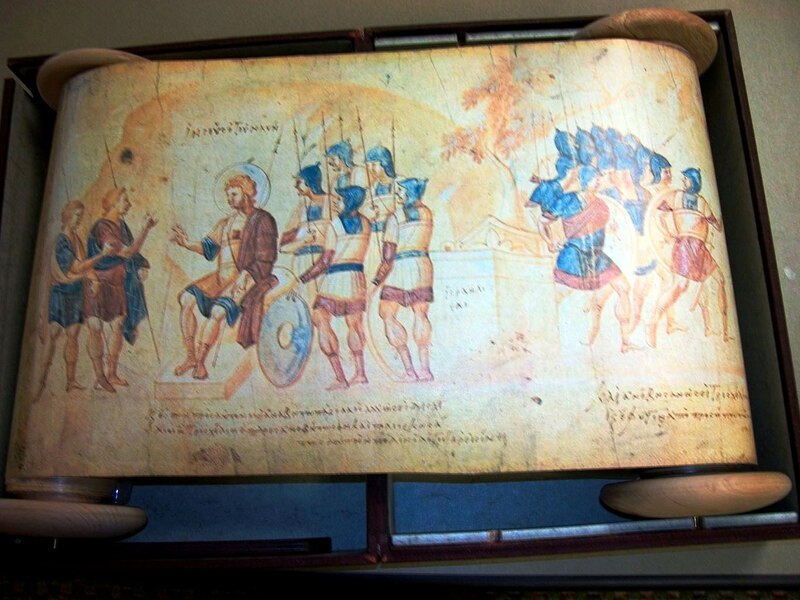 Codices (the codex) were introduced in Late Antiquity and continued developing until the Middle Ages. The scroll was probably replaced by the 6th century AD. Scrolls were read from side to side (volumen) or from top to bottom (rotulus). Ironically, when we read information on the internet, we use the scroll! 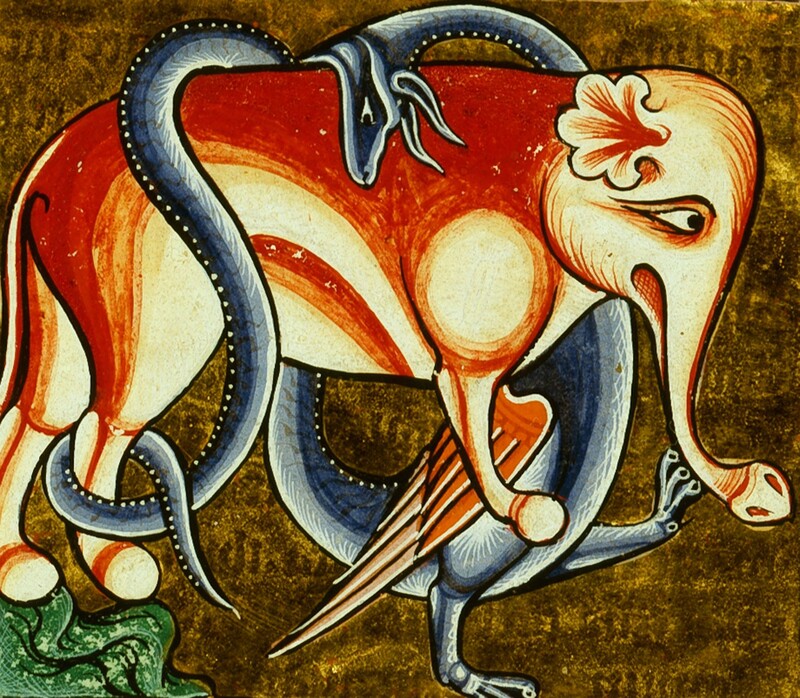 The Ashmole Bestiary is a an early Gothic (Christianized) manuscript. By and large, it features animals that cannot be found in Europe, except for a few. 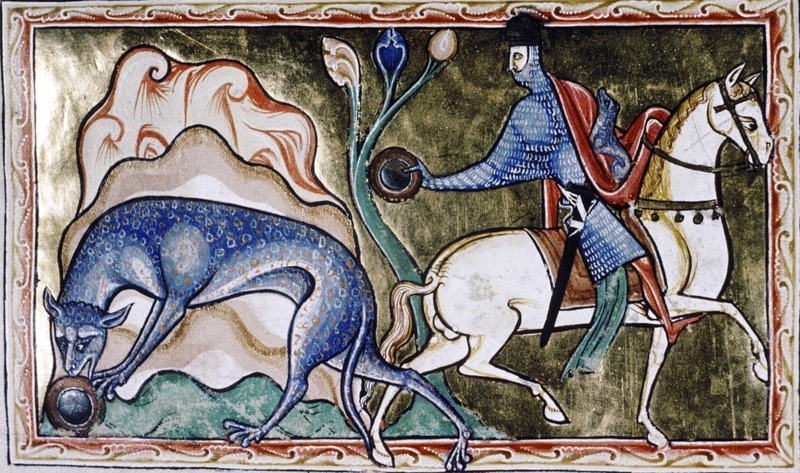 As we know, Bestiaries provided depictions of mythical and mythological, or both, animals. In the case of real animals, information was often obtained from the written accounts of travelers to foreign lands. Such accounts did not provide artists with information that could lead to accurate portrayals of various beasts, a case where the proverbial “picture is worth a thousand words” applies. Short of a picture, a tiger might not look like a tiger. I should think, however, that former portrayals of exotic animals often sufficed. If literature is written in the context of literature (intertextualité), the same is probably true of animal lore, which is illustrated literature. All bestiaries are derived from the Physiologus and from other rather old descriptions of animals. The authors of these descriptions have been listed: Isidore of Seville, Gaius Julius Solinus, Claudius Aelianus or Aelian, or earlier historians, mainly: Pliny the Elder, Aristotle and Herodotus. This is not a complete list, but I believe that providing other sources would be overwhelming and a little redundant. Moreover, my post would be too long. 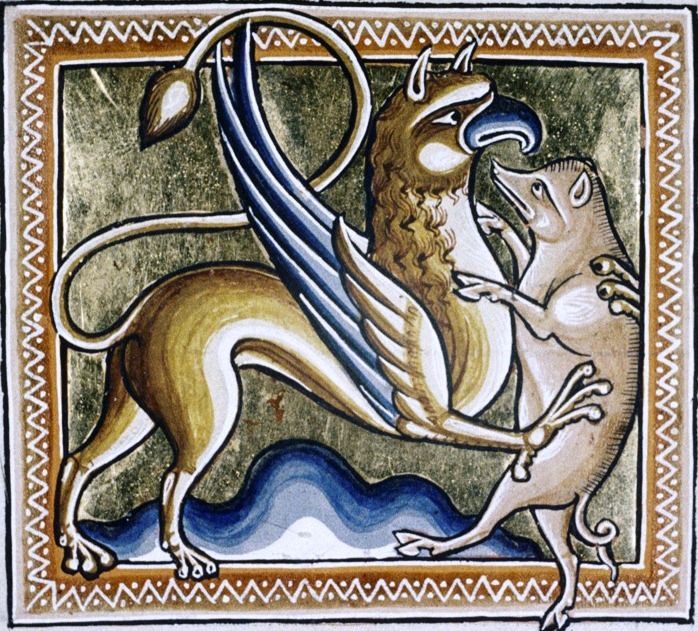 However, if one clicks on The Ashmole Bestiary, one can see a depiction of animals presented in the Ashmole Bestiary. 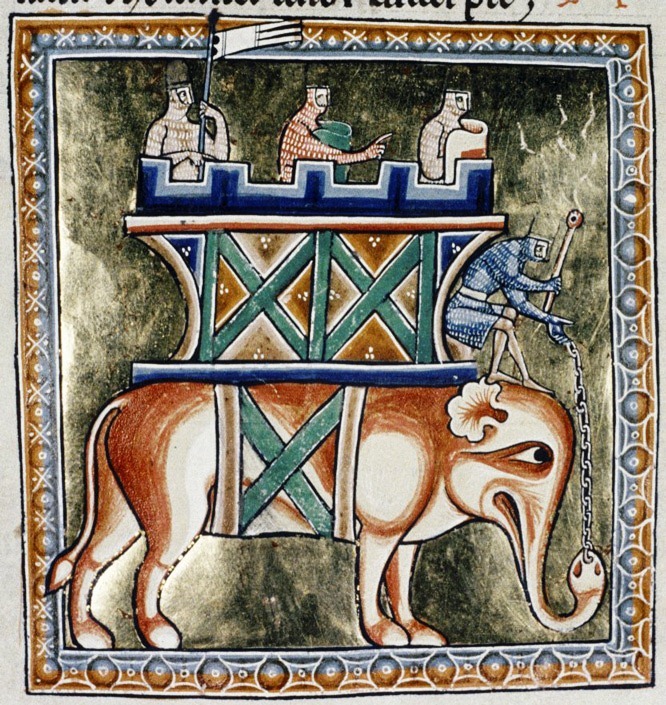 If one clicks on Treasures of the Bodleian, one will find a short description of the Ashmole Bestiary provided by a Bodleian scholar. As stated above, the Ashmole Bestiary is housed at Oxford, in one of the Bodleian libraries. You may wish to look at Gothic art, which is the art associated with Cathedrals such as Notre-Dame de Paris and certain scripts used in Bestiaries. Gothic art followed Romanesque art, starting in the mid 1200s and was followed by Renaissance art. These are large categories, but I have always found it useful to begin with large categories. It simplifies the presentation of most subjects. The rest follows naturally. There will be, of course, an early Gothic and a late Gothic. There are a few more points I wish to discuss concerning illuminated manuscripts. I have not discussed Richard de Fournival’s Bestiaire d’Amour. We may also wish to look at what was happening at the court of Eleanor of Aquitaine (1122 or 1124 – 1 April 1204).